As I’ve stated a week ago, I’m blogging in pursuit of getting my novel published. And I’ve been writing with the intent of getting published for a while. But before I started blogging and novel writing, I was writing my thoughts down in journals. It all started with one of those tiny Lisa Frank notebooks that I had in first grade. I now use composition notebooks because they remind me of one of my favorite children’s book series: Amelia’s Notebooks by Marissa Moss. There are many ways to keep a journal such as a diet journal, a budget journal to keep track of spending, and stuff like that. Right now, I’m keeping a regular journal along with a gratitude journal, a goals journal, and this blog. Why so many journals? I tend to compartmentalize things. My regular journal is where I can be honest with myself. My gratitude journal helps me to remember the little things I appreciate about everyday life, my goals journal is to help me keep track of the big picture (while my planner takes care of the details), and this blog is sort of a progress report about everything overall. So yeah. 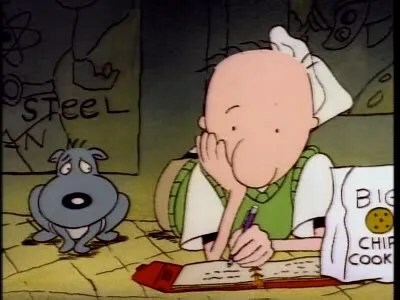 My biggest influences for journal writing were from an obscure children’s book series and a 90s cartoon. Not exactly transcendental or high brow, but I’m a millenial. Here’s a secret about me: I love reading famous diaries. Anne Frank, The Diary of St. Faustina, and the journals of Thomas Merton are all wonderful reads. In a way, diaries give me an insight to a person in a different way than an autobiography. Autobiographies have a way of glossing over things. Don’t get me wrong. I love autobiographies. But journals and diaries are a lot more immediate. Just like a video blog that’s done spur-of-the-moment, a diary or journal captures the thoughts of the moment. There’s no way to gloss things over when emotions are spilling over. There is sort of a downside to the emotional honesty, though. In a lot of my journals, there are rivers of denial. It’s clear now that I wasn’t thinking clearly during those times and that I wanted to convince myself that things were going to turn out a certain way. I guess I thought that if I wrote it down in my journal, I convinced myself that I could keep things at a distance. Now I realize that complete honesty is required when it comes to journal writing. There’s just one thing: if you do decide to keep a journal, I don’t recommend sharing your journal unless it’s done to keep yourself accountable for something. And for goodness’ sake, don’t burn your journals, no matter how lame they are! Keep them in storage, send them to the other side of the world, but for God’s sake, don’t burn them! Someday, there will come a time when you will look back on what you wrote and find that you’ve become a totally different person, a sense of closure from the bad things, and laugh at the stupid things. So what do you think? Do you keep a journal? What are some famous diaries that you’ve read? Any recommendations?